I consider questions of how farmers make decisions in the face of risk and what tools are available to best mitigate those risks. My research contributes to the literature on technology adoption to increase food security and income stability. Risk-mitigating technologies are important for farmers around the world who face uncertainty on many fronts. In my job market paper, I focus on drought risk in East Africa and an agricultural technology with stochastic advantages: Drought-Tolerant Maize. In the future, I will address how environmental uncertainty and the heterogeneous risks of transportation and storage shapes investment decisions among crop choice and agricultural practices. I am an AMA Innovation Lab Researcher. Improved seed technology has the potential to improve quality of life for farmers in developing countries through increased yields and greater resilience to adverse climate events. However, adoption of improved seed technology is low, especially in Eastern and Southern Africa. In one paper, I address the puzzling disconnect between promoted advantages and low adoption rates. I identify hurdles to adopting drought-tolerant maize because of challenges to learning and updating. This work is part of a larger randomized controlled trial in Tanzania and Mozambique evaluating the complementarity of index-based insurance with drought tolerant maize seed. This project is important in rural East Africa, as many farmers neither have access to improved seed nor have the financial tools to consider risky new approaches. My research shows that the cultivation of drought-tolerant maize can stabilize household productivity and reduce food insecurity; however, those who could most benefit from the technology might be the slowest to adopt it—indicating the potential for effective policies to create large gains in welfare for farmers. My AMA Innovation Lab Spotlight covers the partnerships I developed to scale bundled index insurance and drought-tolerant maize in Tanzania. Drought is a primary cause of crop failure, which has severe economic and welfare consequences for farmers in Eastern and Southern Africa. Improved crop varieties, such as drought-tolerant (DT) maize, can provide substantial improvements in yield level and variance. This paper assesses the performance of DT maize in On-Farm trials to identify the advantage of the DT trait under different drought conditions. I find significant heterogeneity in returns from the DT maize seed technology. This is important because variation in realized advantages might moderate the estimated large benefit from the technology. This analysis first evaluates DT maize in comparison with other varieties without that trait. I use On-Farm Trial data from CIMMYT (The International Maize and Wheat Improvement Center) and high-resolution precipitation data. DT maize indeed has a significant 10% yield gain, on average. Further, DT maize is less sensitive to drought than comparison varieties, demonstrating a significant protective effect. I then investigate how the DT trait advantage varies from more and less controlled environments. There are demonstrated high returns to the technology in the very-controlled On-Station Trials. There is heterogeneity in the advantages in the less-controlled On-Farm Trials. I further analyze this heterogeneity using a quantile regression approach. For low-performing farms, those with poor soils and agronomic practices, the protective effect is reduced in magnitude and statistical significance. My AAEA 2017 poster on drought-tolerant maize response to precipitation in East Africa uses on-farm trial data from CIMMYT. 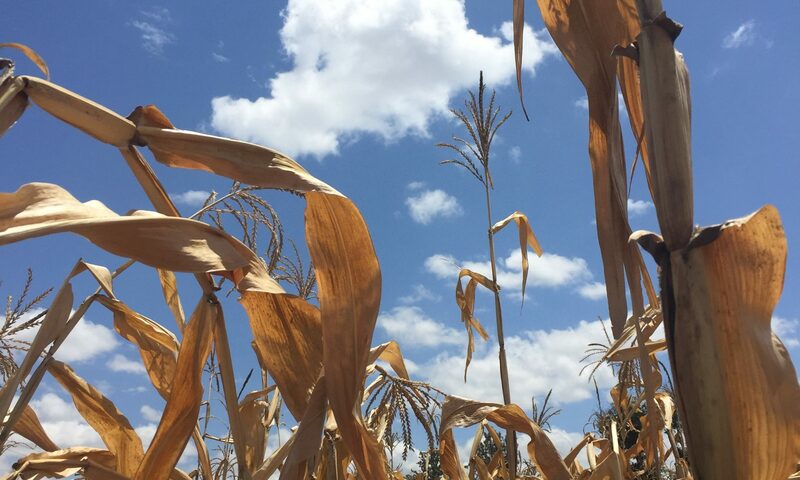 Traditional varieties of maize frequently fail due to drought pressure in East Africa, yet farmers are slow to adopt new drought-tolerant varieties. One reason is that both the risk and returns from adopting drought-tolerant maize depend on irregular exogenous weather outcomes. Farmers make adoption decisions based on his subjective beliefs about the likelihood of drought and the crop response to drought stress. Updating such beliefs is a slow process because severe drought can mask the trait advantage, and droughts that showcase this advantage are less frequent than drought in general. Drought-tolerant maize can improve household welfare through increased yield stability and income security, yet there is not widespread adoption. I develop a learning model to show the role of expectations in the adoption decision explaining the limited uptake under normal learning conditions. Then, combining rich household survey data with high-resolution rainfall and yield data, I give empirical evidence on adoption behavior, suggesting that if improved varieties are a useful intervention, promotion activities and risk-mitigating tools such as crop insurance must support uptake. I presented in the AAEA 2018 Risk and Uncertainty Lightning Session. This paper explores household asset allocation under risk using the portfolio choice framework. Using simulations and data from a framed field experiment conducted in Burkina Faso, I find that the introduction of the risk-free savings instrument increases welfare for those at the bottom of the wealth distribution. In arid agricultural settings, households often have little access to resources to respond to negative shocks. Allocation strategies are important for household asset accumulation and policy for development of financial tools and institutions. CGAP Working Paper link, and our working paper: Resilience and health shocks. For agricultural households, every economic decision bears some amount of risk, or the possibility of an adverse outcome. Decision makers use available information, including knowledge about risk, to determine their expectations of the future: uncertainty can weigh heavily in decisions. In the case of agricultural households, production and market risk and uncertainty can have real consequences for decisions. Understanding expectation formation and effects is crucial for successful development policy. Using household survey data collected in 12 villages across six communes around Lac Alaotra in Madagascar in 2004, I analyze the relationship between rice price expectations and labor input decision making.